March 19, 2019 at 6:30 am. Seeking rotation depth, the New York Yankees reached an agreement on a minor league deal with free agent left-hander Gio Gonzalez on Monday night. According to multiple media reports, Gonzalez would receive $3 million plus incentives if he makes the major league club. Gonzalez also could choose to become a free agent again if he isn’t added to the Yankees’ big-league squad by April 20, multiple media outlets reported. “It gives him an opportunity to come to camp and compete in front of us and others,” Yankees general manager Brian Cashman said, according to ESPN. The Yankees’ concerns about starting pitching increased Friday with the news that right-hander Luis Severino probably would be sidelined through April because of inflammation in his right shoulder. Left-hander CC Sabathia also could be sidelined deep into the season’s first month as he recovers from knee and heart ailments. 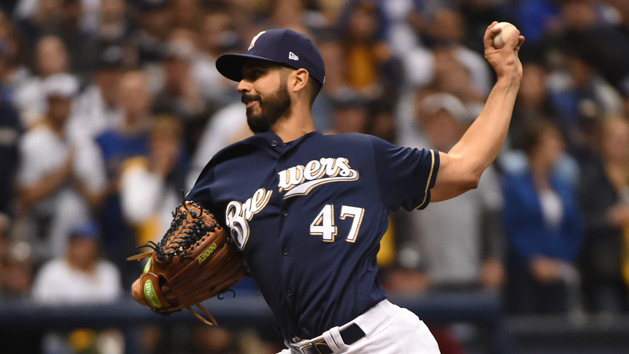 Gonzalez, 33, split last season between the Washington Nationals and the Milwaukee Brewers, getting dealt on Aug. 31 in exchange for two minor-leaguers. He finished the year a combined 10-11 with a 4.21 ERA in 32 starts. In the 2018 postseason, he didn’t pitch for Milwaukee in the National League Division Series, but he made two starts in the NL Championship Series against the Los Angeles Dodgers, allowing two runs in a total of three innings. He exited Game 4 in the second inning due to a sprained left ankle, and he didn’t appear again in the series. Gonzalez pitched for the Oakland A’s from 2008-11, then was with the Nationals from 2012 through most of 2018. He was an All-Star in his final season for Oakland, going 16-12 with a 3.12 ERA, and in his first season for Washington, finishing 21-8 with a 2.89 ERA. He was the NL victory leader in 2012, and he finished third in Cy Young Award voting that year.